While religion remains important in the lives of most Americans, the 2014 Religious Landscape Study finds that Americans as a whole have become somewhat less religious in recent years by certain traditional measures of religious commitment. For instance, fewer U.S. adults now say religion is very important in their lives than did so seven years ago, when Pew Research Center conducted a similarly extensive religion survey. Fewer adults also express absolutely certain belief in God, say they believe in heaven or say their religion’s sacred text is the word of God. The change in Americans’ religious beliefs coincides with the rising share of the U.S. public that is not affiliated with any religion. The unaffiliated not only make up a growing portion of the population, they also are growing increasingly secular, at least on some key measures of religious belief. For instance, fewer religious “nones” say religion is very important to them than was the case in 2007, and fewer say they believe in God or believe in heaven or hell. Among people who do identify with a religion, however, there has been little, if any, change on many measures of religious belief. People who are affiliated with a religious tradition are as likely now as in the recent past to say religion is very important in their lives and to believe in heaven. They also are as likely to believe in God, although the share of religiously affiliated adults who believe in God with absolute certainty has declined somewhat. When seeking guidance on questions of right and wrong, a plurality of Americans say they rely primarily on their common sense and personal experiences. But there has been a noticeable increase in the share of religiously affiliated adults who say they turn to their religious teachings for guidance. This chapter takes a detailed look at the religious beliefs of U.S. adults – including members of a variety of religious groups – and compares the results of the current study with the 2007 Religious Landscape Study. The chapter also examines Americans’ views on religion and salvation, religion and modernity, and religion and morality. Three-quarters of U.S. adults say religion is at least “somewhat” important in their lives, with more than half (53%) saying it is “very” important. Approximately one-in-five say religion is “not too” (11%) or “not at all” important in their lives (11%). Although religion remains important to many Americans, its importance has slipped modestly in the last seven years. In 2007, Americans were more likely to say religion was very important (56%) or somewhat important (26%) to them than they are today. 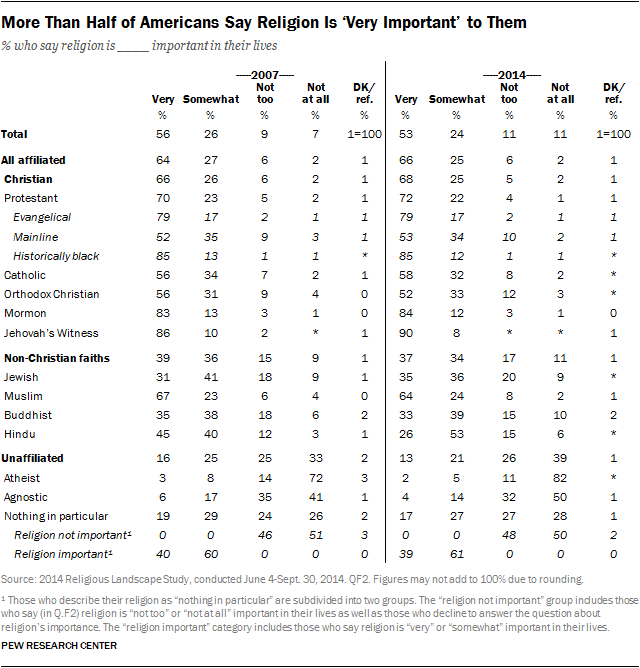 Only 16% of respondents in 2007 said religion was not too or not at all important to them. The decline in the share of Americans who say religion is very important in their lives is closely tied to the growth of the religiously unaffiliated, whose share of the population has risen from 16% to 23% over the past seven years. Compared with those who are religiously affiliated, religious “nones” are far less likely to describe religion as a key part of their lives; just 13% say religion is very important to them. Furthermore, the share of the “nones” who say religion is not an important part of their lives has grown considerably in recent years. Today, two-thirds of the unaffiliated (65%) say religion is not too or not at all important to them, up from 57% in 2007. For Americans who are religiously affiliated, the importance people attach to religion varies somewhat by religious tradition. Roughly eight-in-ten or more Jehovah’s Witnesses (90%), members of historically black Protestant churches (85%), Mormons (84%) and evangelical Protestants (79%) say religion is very important in their lives. These figures have stayed about the same in recent years. Smaller majorities of most other religious groups say religion plays a very important role in their lives. This includes 64% of Muslims, 58% of Catholics and 53% of mainline Protestants. Roughly half of Orthodox Christians (52%) also say this. Fewer Jews, Buddhists and Hindus say religion is very important to them, but most members of those groups indicate that religion is at least somewhat important in their lives. The survey also finds that older adults are more likely than younger adults to say religion is very important in their lives, and women are more likely than men to express this view. Additionally, those with a college degree typically are less likely than those with lower levels of education to say religion is very important in their lives. 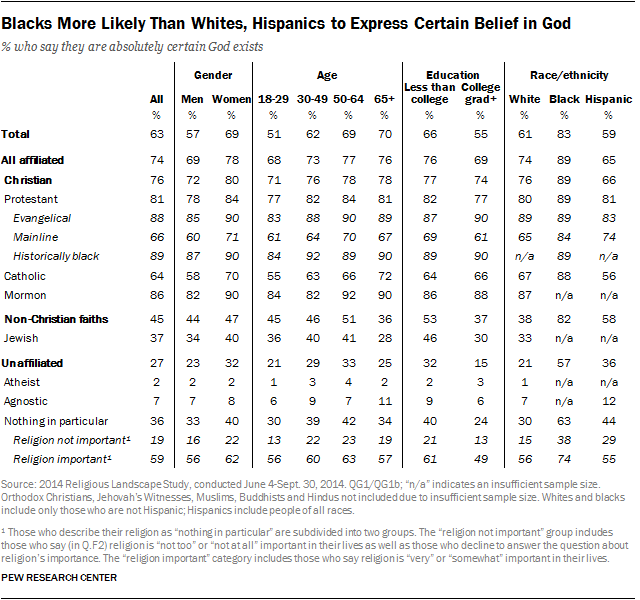 And blacks are much more likely than whites or Hispanics to say religion is very important in their lives. These patterns are seen in the population as a whole and within many – though not all – religious groups. Nearly nine-in-ten Americans (89%) say they believe in “God or a universal spirit,” and most of them (63% of all adults) are absolutely certain in this belief. There has been a modest decline in the share of Americans who believe in God since the Religious Landscape Study was first conducted in 2007 (from 92% to 89%), and a bigger drop in the share of Americans who say they believe in God with absolute certainty (from 71% to 63%). Majorities of adherents of most Christian traditions say they believe in God with absolute certainty. But this conviction has declined noticeably in recent years among several Christian groups. The largest drops have been among mainline Protestants (down from 73% in 2007 to 66% today), Catholics (from 72% to 64%) and Orthodox Christians (from 71% to 61%). Among non-Christians, the pattern is mixed. Most Muslims (84%) are absolutely certain that God exists, but far fewer Hindus (41%), Jews (37%) or Buddhists (29%) are certain there is a God or universal spirit. As was the case in 2007, most religiously unaffiliated people continue to express some level of belief in God or a universal spirit. However, the share of religious “nones” who believe in God has dropped substantially in recent years (from 70% in 2007 to 61% today). And religious “nones” who believe in God are far less certain about this belief compared with those who identify with a religion. In fact, most religiously unaffiliated believers say they are less than absolutely certain about God’s existence. 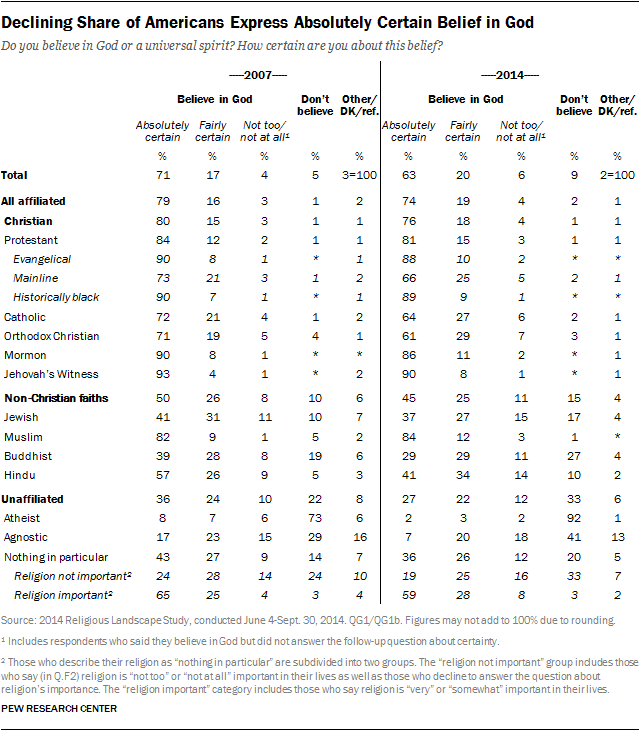 Nearly one-in-ten U.S. adults overall (9%) now say they do not believe in God, up from 5% in 2007. Women are much more likely than men to say they are absolutely certain about God’s existence (69% vs. 57%), and older Americans are much more likely than younger adults to say they are absolutely convinced that God exists. Two-thirds of those with less than a college degree express certainty about God’s existence, compared with 55% of college graduates. Additionally, 83% of blacks say they are absolutely certain about God’s existence, while roughly six-in-ten whites (61%) and Hispanics (59%) hold this view. There is considerable variation in the way members of different religious groups conceive of God. For example, seven-in-ten Christians think of God as a person with whom people can have a relationship. Only about a quarter of those who belong to non-Christian faiths (26%) share this view. Among non-Christian faiths, it is more common to see God as an impersonal force. Among the religiously unaffiliated, roughly three-in-ten (31%) say God is an impersonal force, a quarter say God is best viewed as a person and a third say God does not exist. However, among the subset of religious “nones” who describe their religion as “nothing in particular” and who also say religion is very or somewhat important in their lives, a slim majority (53%) say they believe in a personal God. 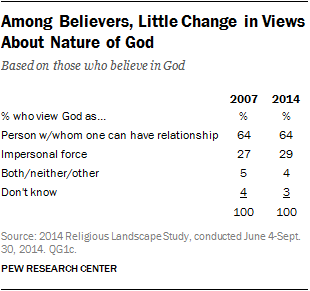 Although the share of adults who believe in God has declined modestly in recent years, among those who do believe in God, views about the nature of God are little changed since 2007. In both 2007 and 2014, roughly two-thirds of people who believe in God said they think of God as a person, while just under three-in-ten see God as an impersonal force. Belief in heaven is nearly universal among Mormons (95%) and members of the historically black Protestant tradition (93%). Belief in heaven also is widely held by evangelical Protestants (88%), Catholics (85%), Orthodox Christians (81%) and mainline Protestants (80%). The vast majority of Muslims (89%) also believe in heaven. About half of Hindus in the survey (48%) say they believe in heaven, as do 47% of Buddhists surveyed. The only groups where significantly fewer than half say they believe in heaven are Jews (40%) and the unaffiliated (37%). 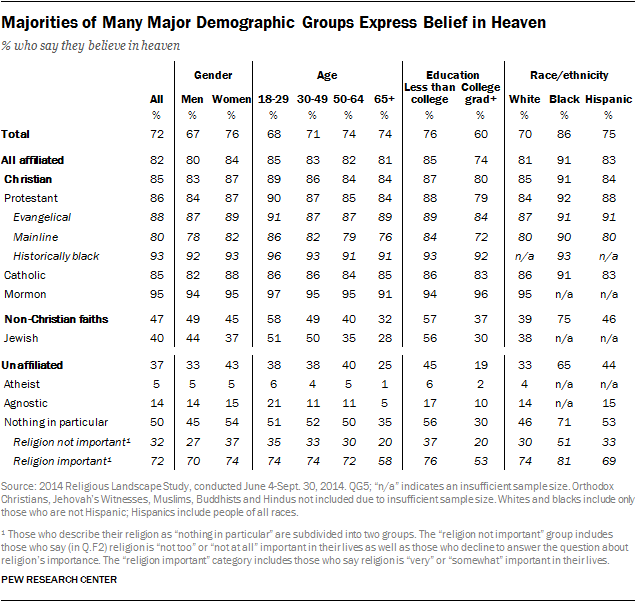 While relatively few atheists or agnostics believe in heaven, a large share of those whose religion is “nothing in particular” and who also say religion is at least somewhat important in their lives do believe in heaven (72%). The survey also finds that, overall, women are more likely than men to say they believe in heaven, and those with less than a college degree are more likely than those with a college degree to express this view. Slightly bigger shares of blacks and Hispanics than whites say they believe in heaven, and older Americans are slightly more likely than younger adults to hold this belief. In many cases, however, these demographic differences in belief in heaven are smaller within religious traditions than among the public as a whole. Among evangelical Protestants, for example, men are just as likely as women to believe in heaven, and young people are just as likely as older evangelicals to hold this belief. Belief in “hell, where people who have lived bad lives and die without being sorry are eternally punished,” is less widespread than belief in heaven. About six-in-ten Americans (58%) believe in hell, little changed from 2007. Belief in hell is most common among members of historically black Protestant churches (82%) and evangelical Protestant churches (82%). Somewhat fewer Catholics (63%), Mormons (62%), mainline Protestants (60%) and Orthodox Christians (59%) say they believe in hell. Three-quarters of U.S. Muslims (76%) believe in hell, but belief in hell is less common among other non-Christian groups, including Buddhists (32%), Hindus (28%), Jews (22%) and the religiously unaffiliated (27%). U.S. adults with less than a college degree are more likely than college graduates to say they believe in hell, and blacks are more likely than Hispanics and whites to believe in hell. However, there are minimal differences between men and women and between younger and older adults on this question. Six-in-ten Americans (60%) view their religion’s sacred text as the word of God. This represents a slight decline from 2007, when 63% of the public held this view. Within most religious groups, there has been little movement on this question, but among the unaffiliated, there has been a modest decline in the share who view the Bible as the word of God (from 25% to 21%). Three-quarters of Christians believe the Bible is the word of God, including about nine-in-ten evangelicals (88%), Mormons (91%) and Jehovah’s Witnesses (94%). Among members of other Christian traditions, smaller majorities say the Bible is the word of God. Although there is widespread agreement across Christian groups on this question, there is disagreement about whether the Bible can be taken “literally, word for word.” Most evangelical Protestants (55%) and members of historically black Protestant churches (59%) believe the Bible should be taken literally, but fewer Christians from other traditions espouse a literalist view of the Bible. There has been little change in recent years in the share of Christians who believe the Bible should be interpreted literally, word for word. Most Muslims (83%) accept the Quran (also spelled Koran) as the word of God. 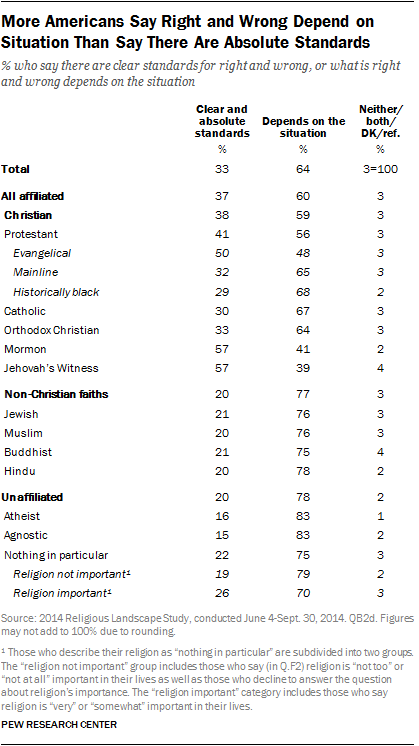 Far fewer Jews (37%), Hindus (29%) and Buddhists (15%) say their scripture is the word of God. The share of the unaffiliated who believe the Bible was written by men and is not the word of God has risen by 8 percentage points in recent years, from 64% in 2007 to 72% in 2014. But while most religious “nones” say the Bible was written by men, about half of those who say they have no particular religion and who also say religion is at least somewhat important in their lives believe the Bible is the word of God (51%). As on some other traditional measures of religious belief, older adults are more likely than younger adults to say their religion’s holy text is the word of God. And those with less than a college degree also are much more likely than college graduates to say their religion’s scripture is the word of God. 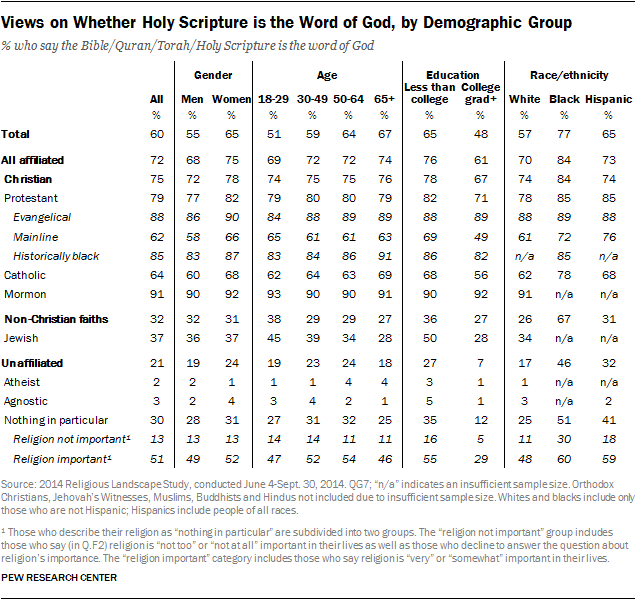 Additionally, more women than men and more blacks than Hispanics and whites say their religion’s holy text is the word of God. For the most part, however, differences in beliefs about the Bible are larger across religious traditions (e.g., between evangelicals and Catholics and religious “nones”) than differences between demographic groups within the same religious tradition. These findings are little changed from 2007, when 44% of affiliated respondents said their religion should preserve its traditional beliefs and practices, 35% said their religion should adjust its traditional beliefs and 12% said their religion should adopt modern beliefs and practices. 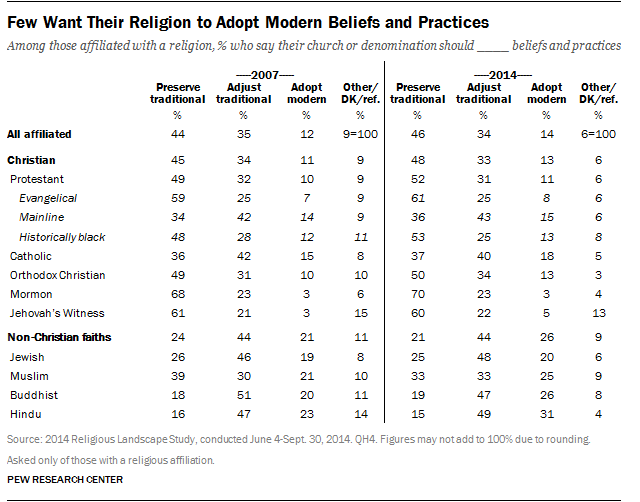 The belief that their religion should preserve traditional practices is held by most Mormons (70%), Jehovah’s Witnesses (60%), evangelical Protestants (61%) and members of historically black Protestant churches (53%), as well as half of Orthodox Christians (50%). Muslims are closely divided on whether their religion should preserve traditional beliefs and practices or adjust traditional beliefs and practices in light of new circumstances. Among other religious groups, including Jews, mainline Protestants and Catholics, the most common view is that religions should adjust traditional practices. Two-thirds of those who identify with a religious group say many religions (not just their own) can lead to eternal life, down slightly from 2007, when 70% of all religiously affiliated adults said this. This view is held by the vast majority of mainline Protestants (80%) and Catholics (79%), as well as smaller majorities of Orthodox Christians (68%) and members of historically black Protestant churches (57%) and about half of evangelicals (52%). Fewer than half of Mormons (40%) and only about one-in-ten Jehovah’s Witnesses (8%) believe that many religions can lead to eternal life. Among the non-Christian religious traditions that are large enough to be analyzed, most say many religions can lead to eternal life. 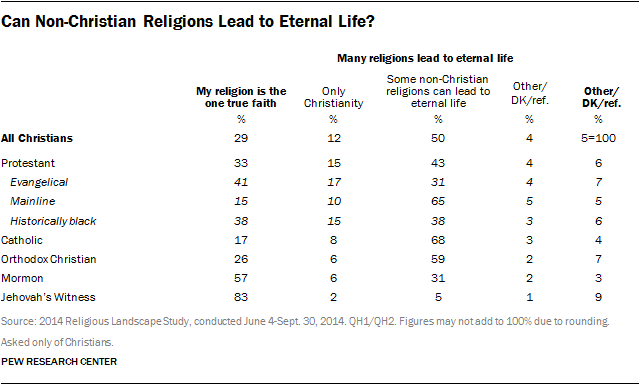 Most Christians who say many religions can lead to eternal life also say non-Christian religions can lead to heaven. In fact, half of all Christians say some non-Christian faiths can lead to eternal life, while about four-in-ten say either that theirs is the one true faith leading to eternal life or that only Christianity can result in everlasting life. About one-in-ten Christians express no opinion or provide other views on these matters. Two-thirds of Catholics (68%) and mainline Protestants (65%) say some non-Christian religions can lead to eternal life, as do 59% of Orthodox Christians. This view is less common among other Christian groups. Roughly four-in-ten members of historically black Protestant denominations (38%) say some non-Christian religions can lead to eternal life, as do three-in-ten evangelical Protestants and Mormons (31% each). Very few Jehovah’s Witnesses (5%) believe this. When looking for answers to questions about right and wrong, more Americans say they turn to practical experience and common sense (45%) than to any other source of guidance. The next most common source of guidance is religious beliefs and teachings (33%), while far fewer turn to philosophy and reason (11%) or scientific information (9%). Since the 2007 Religious Landscape Study, however, the share of U.S. adults who say they turn to practical experience has decreased by 7 percentage points (from 52% to 45%) while the share who say they look to religious teachings has increased by 4 points (from 29% to 33%). This turn to religious teachings as a source of moral guidance has occurred across many religious traditions, with the largest increases among evangelical Protestants and Catholics. Six-in-ten or more evangelical Protestants, Mormons and Jehovah’s Witnesses say they turn to religious teachings and beliefs for moral guidance. Members of historically black Protestant churches are more divided: 47% say they rely on religious teachings while 41% rely on practical experience. Fewer Catholics (30%), mainline Protestants (29%) and Orthodox Christians (27%) turn primarily to religion for guidance on questions of right and wrong. Fewer religious “nones” now say they use common sense and practical experience as their main source of guidance in this area (57%) than said this in 2007 (66%). But instead of finding guidance through religious teachings, more of the “nones” are turning to scientific information; the share who say they rely on scientific information has increased from 10% to 17% in recent years. The reliance on science is most common among self-identified atheists; one-third of this group (32%) relies primarily on scientific information for guidance on questions of right and wrong. While Christians overall are more likely than members of other religious groups to say there are absolute standards for right and wrong, there are large differences within Christianity. 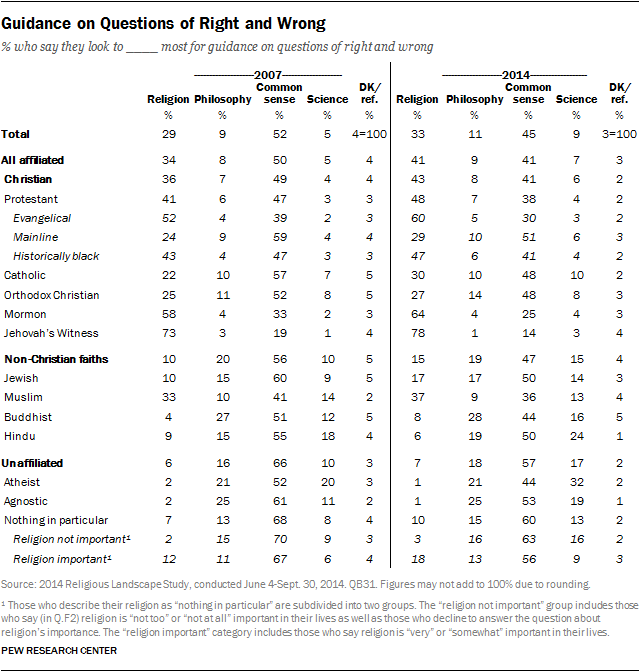 Nearly six-in-ten Mormons (57%) and Jehovah’s Witnesses (57%) say there are clear standards for right and wrong. Evangelical Protestants are divided in their opinions, with 50% saying there are absolute standards and 48% saying it depends on the situation. Fewer Orthodox Christians (33%), mainline Protestants (32%), Catholics (30%) and members of the historically black Protestant tradition (29%) say there are clear and absolute standards of right and wrong.